Jeremy Haladyna and newfound friends at the Copán Museum, Copan, Honduras. 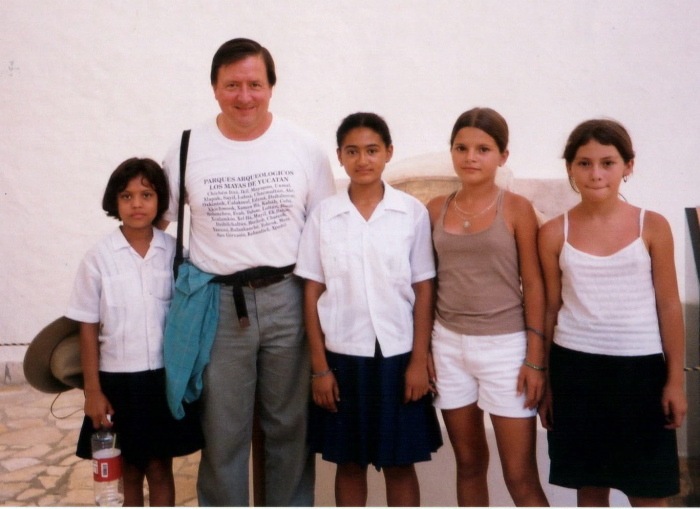 On the day he visited in 2001, the site was crowded with school children visiting and taking justifiable pride in this magnificent World Heritage Mayan site. Eleven trips to the Mayan region and an investigation of more than 30 years into Precolumbian thought have indelibly marked and changed the work of this U.S.-born composer. Haladyna’s Mayan Cycle now stretches to over 30 highly distinctive pieces, including such titles as Zaquico’xol, El Llanto de Izamal, The Maya Curse Pedro de Alvarado, Pok-ta-Pok, 2012, The Oracle of 13 Sky, Copal, and the Jaguar Poems. Jeremy, Director of UC Santa Barbara’s Ensemble for Contemporary Music, holds prizes and academic qualifications from three countries. A laureate of the Lili Boulanger Prize and diplômé of the history-rich Schola Cantorum on Paris' Left Bank, he also holds an advanced degrees from the University of Surrey (U.K.) and the University of California. He has taught undergraduate composition at UCSB since 1991, and was named to its permanent faculty in March, 2000. His own past teachers include William Kraft, Karl Korte, Eugene Kurtz, Jacques Charpentier, and Joseph Schwantner. In addition to active performing, Jeremy teaches orchestration and is a senior faculty member of the College of Creative Studies, UCSB. As pianist, composer, conductor and organist, he has long been committed to the espousal of new music. His own music has been heard at Carnegie (Weill) Hall; King's College, London; St. John's Smith Square, London; South Bank Centre, London; the Monday Evening Concerts, Los Angeles; St. Paul's Cathedral, London; All Saints Church, London; BMIC, London; and the National Museum of Art, Mexico City. In December 1999 he premiered his The Vision Serpent at the Chopin Academy, Warsaw during a guest residency, also lecturing on the Mayan Cycle. In October, 2000 he was invited to present excerpts from the cycle as the subject of a colloquium at Kings College, London. In 2009 Mayan Cycle elements were brought to concerts in Instanbul, Turkey as part of a composer-conductor residency at MIAM. In 2009 an integral album release entirely from the Mayan Cycle appeared on innova; a 2nd innova issue followed in 2012.